Trusted LASIK Surgeons launched its revolutionary Trusted LASIK Surgeons directory service and website at http://www.TrustedLASIKSurgeons.com in order to provide a resource for consumers seeking to improve their vision. What sets the Trusted LASIK Surgeons directory apart is a unique screening process ensuring that only those who are among the best in LASIK eye surgery and laser eye surgery in the United States are listed. Refractive eye surgeons, such as Dr. Roy Chuck, are screened based on their experience, research, publications, lectures and patient care standards. Trusted LASIK Surgeons believes Doctor Chuck's research, experience, and other professional accomplishments place him among the top 1% of LASIK surgeons in the United States. His practice at the Wilmer Eye Institute serves the the Baltimore and Washington D.C. area as well as Arlington, Bethesda, Washington D.C., Dover and Newark in Delaware. Trusted LASIK Surgeons announced today that Eye Surgery , Vision Correction Surgeon, Doctor Roy Chuck, MD, PhD, of the Wilmer Laser Vision Center at Johns Hopkins in Baltimore, Maryland has joined the Trusted LASIK Surgeons Directory, an informational resource for consumers looking for vision correction and improvement through laser and lasik eye surgery or another refractive eye surgery procedures. Dr. Chuck's practice primarily serves patients seeking laser eye surgery in Baltimore, Maryland,Arlington, Bethesda, and Frederick, Washington D.C., Dover and Newark in Delaware, as well as surrounding states, and patients visiting internationally. Trusted LASIK Surgeons directory service seeks to list only those LASIK eye surgeons who are among the best in the United States. To do this, Trusted LASIK Surgeons utilizes screens each surgeon based on experience, premier patient care, and professional credentials. Trusted LASIK Surgeons estimates that Dr. Chuck's outstanding achievements place him in an elite circle comprising the top 1% of LASIK eye and refractive surgeons in the United States. The most significant professional qualifications that set Dr. Chuck apart from nearly all other LASIK Surgeons are his research, inventions, teaching and experience. He has served as a principal investigator for 5 FDA studies for vision correction lasers and lens implants as well as 5 FDA studies as a co-investigator. He has 12 inventions in the field of ophthalmology to his credit. Dr. Chuck has also written 11 textbook chapters and/or textbooks, and has published over 90 articles for major peer-reviewed eye journals. 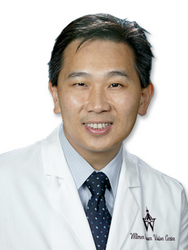 In addition, he serves in an editorial capacity for the Journal of Refractive Surgery (ISRS/AAO), Lasers in Surgery and Medicine (ASLMS), and Refractive Surgery: Current Opinion in Ophthalmology. Dr. Chuck has presented at over 100 lectures at major eye meetings throughout the world. His substantial contributions to the field of refractive eye surgery have earned him the world-wide respect of his peers. He is also a consultant for leading companies in improving vision such as Alcon and Advanced Medical Optics. His academic appointment as the Tom Clancy Professorship of Ophthalmology and Director of Refractive Surgery at the Wilmer Eye Institute of Johns Hopkins University clearly demonstrates his expertise. The Wilmer Eye Institute is repeatedly ranked as the top eye care center in the nation in surveys by U.S. News & World Report and Ophthalmology Times. In the course of helping people improve their vision, Dr. Chuck has performed over 5,000 LASIK and laser vision procedures. With over 12 years of experience in laser vision surgery, including LASIK, and 14 years of experience in refractive surgery procedures such as laser vision correction, lens implants, and radial keratotomy, Dr. Chuck has the proven know-how to provide patients with the best care available. Dr. Chuck's practice at The Wilmer Eye Institute at Johns Hopkins provides state-of-the-art patient care, including: (a) use of IntraLase system for "All-Laser" or "Bladeless" LASIK, (b) use of Wavefront Based ("Custom") LASIK and PRK, and (c) iLASIK procedure, which includes WaveScan Technology, IntraLase, and Visx Advanced CustomVue treatments. Dr. Chuck and the Wilmer Eye Institute treat a full range of vision problems including nearsightedness (myopia), farsightedness (hyperopia), astigmatism (blurred vision), and presbyopia. Dr. Chuck offers not just LASIK and PRK (laser eye surgery procedures), but other procedures like RLE/CLE (lens implants), conductive keratoplasty, phakic implants, limbal relaxing incisions, and cataract lens implants to ensure patients have a complete range of options when it comes to choosing the right one to best correct their vision. New patients suffering from complications from LASIK eye surgery or another vision correction procedure performed by another surgeon often seek Dr. Chuck to manage and treat their problems. In addition, other eye surgeons, eye doctors, and their family members regularly seek Dr. Chuck to perform their LASIK or other refractive surgery procedure. Board-certified ophthalmologist by the American Board of Ophthalmology, this highly qualified surgeon is a member of the American Academy of Ophthalmology who has honored him with an Achievement Award, the International Society of Refractive Surgery, American Society for Laser Medicine and Surgery, the Chinese American Ophthalmological Society and several other professional, as well as many other professional organizations dedicated toward improving vision care. Roy Chuck, MD, PhD., has been named one of the "Top Doctors" in Baltimore by Baltimore magazine. He is a member of the Alpha Omega Alpha National Medical Honor Society and has also been honored with a Heed Ophthalmic Foundation Fellowship and a National Eye Institute ARVO Travel Grant, and National Institutes of Health Research Grants. "I have known and respected Dr. Chuck for over 10 years beginning when he first became active in refractive surgery at the Doheny Eye Institute at the University of Southern California and continuing with his service at the Wilmer Eye Institute at Johns Hopkins. His many accomplishments are well summarized in this press release which gives a sense of the scope of his contributions to refractive eye surgery. I was also pleased to learn that he is the current President of the Chinese Society of Ophthalmology and is very active in teaching the latest refractive surgery techniques to eye doctors in China," commented James J. Salz, M.D., Chief Executive Officer of Trusted LASIK Surgeons. The Wilmer Eye Institute has been performing laser vision correction since the early 1990's and has performed thousands of surgeries to date. Our facilities are state-of-the-art with the most technically advanced equipment designed to make your procedure as safe and efficient as possible. The Wilmer Laser Vision Center utilizes the iLASIK system which includes the VISX WaveScan Wavefront ™System, IntraLase FS ™ Femtosecond Laser and the VISX STAR S4 IR ™Excimer Laser for our laser vision correction procedures. Our laser vision correction surgeons are members of the Trusted LASIK Surgeons Directory. The Wilmer Eye Institute is repeatedly ranked as the top eye care center in the nation in surveys by U.S. News & World Report and Ophthalmology Times. The Wilmer Eye Institute has been a leader in laser vision care and has developed some of the earliest lasers for vision care and pioneered laser removal of corneal scars and laser treatment for corneal diseases. The Wilmer Eye Institute participated in the first clinical trials of laser correction for nearsightedness, farsightedness and wavefront technology and continues to participate in clinical trials for approvals of new advanced excimer laser software and technology. Wilmer is helping to develop the next generation of laser vision correction procedures. The laser surgeons at The Wilmer Laser Vision Center are full-time faculty members of The Johns Hopkins Hospital, Wilmer Eye Institute and are highly trained cornea experts who can help you to understand laser vision correction and its impact on your long-term vision health. The Wilmer Eye Institute trains more eye experts, are entrusted to perform more eye research than any other center and have contributed to amazing advances in eye care. For more information about the Wilmer Laser Vision Center, please visit: http://www.hopkinsmedicine.org/wilmer/lasik.